I made this cute little V-Day card for the assistants at my children's school. 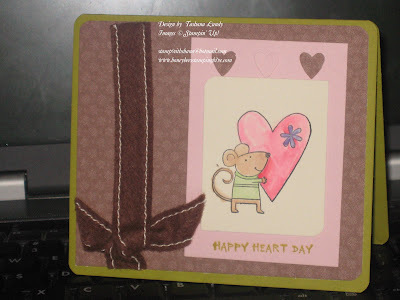 I used Happy Heart Day stamp set, the Heart to Heart punch and the Candy Lane DSP. The ribbon is from the Alpine Ribbon Originals (retired). I used Pink Pirouette, Kiwi Kiss, and Very Vanilla card stock. I colored the image using my Aqua Painter.